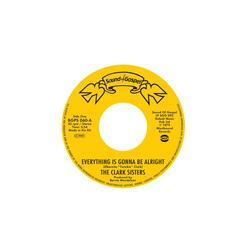 (5% DISCOUNT THRU 5-24-19) The Clark Sisters mix soul and gospel to fantastic effect on this Sound Of Gospel 45. 'Everything Is Gonna Be Alright' was edited down for 7-inch release, but that was shelved, so it is released in the correct format for the first time. The Grammy-winning hit single 'You Brought The Sunshine' had its own 7-inch edit which we bring you here.